Dr.Dina is a pediatrician who specializes in emergency medicine. She works at Sick Kids and is the founder of Kidcrew a forward-thinking clinic focused on patient experience for children and families of all ages offering paediatricians, allergists, neurologists, sport medicine and more covering your family head to toe and is located on Bathurst St, south of St. Clair. 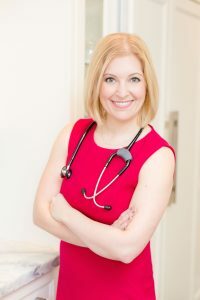 Dr. Dina lives in Toronto with her 3 sons, 2 dogs, and her husband. Spynga: You’ve been coming to Spynga for many years now, what do you enjoy about Spynga and what’s kept you coming back? Dr. Dina: I love the staff and the teachers. There is an awesome energy at Spynga and Ialways know I’ll get a great workout in a friendly environment. There are all sorts of people at Spynga, and everyone feels comfortable. Spynga: You’re often described as an adrenaline junkie, what’s your favourite way to get an adrenaline fix? Dr. Dina: Honestly, my daily AM workout. I need to get my heart rate up every morning before I start seeing patients. I take my kids to school, head to the gym, then to work. Spynga: Why did you choose a career in pediatric medicine, has being a parent affected how you view your field and work? Dr.Dina: Pediatrics chose me. I was 3 when I told my parents I wanted to be a doctor, and by 4 I told them I wanted to be a ‘kids doctor’. I am so blessed to have this one career dream and it’s a reality. Spynga: You’ve written about taking your sons to yoga classes at Spynga, did they resist going at all? Dr.Dina: They love it! They love coming with me to my workout as they know how important it is to me. They crave exercise like me. They are like my dogs – they need to run around at least twice a day. For my older son, who is almost 7, he prefers a higher energy workout, but likes the chill of kid yoga too. My 5 year old loves any exercise and is a huge fan of yoga. Can’t wait to get my 2 year old into the studio. Spynga: How have your children benefited from starting yoga around the age of 2? Dr. Dina: They value the chill kind of exercise. Mindfulness. Peace. Calm. Very important values for crazy boys! Spynga: Today there’s lots of worry about children being to inactive and watching too many screens, would you say that starting kids young with regular scheduled activity helps avoid that pitfall? Dr. Dina: I think any time kids can be active, that’s a huge benefit. We know that all kids should have at least 60 min of heart pumping activity a day, and yoga contributes to that. More time being active = less time in front of a screen, and that is very important for me and for your kids. Spynga: What advice do you have for parents who are worried their child may be resistant to practicing yoga? Dr.Dina: Just try it – what’s the harm? They will probably have so much fun. Spynga: You’re the founder of KidCrew, what prompted this amazing creation? Dr. Dina: There are so many kids in Toronto seeking excellent health care. Many kids see specialists and every kid needs a dentist. Kidcrew is designed for kids and families to have fun, and have every service they need under one roof. One stop for kids’ health! Spynga: You seem very busy with UofT, Sick Kids, KidCrew and DrDina.ca as well as being a parent of three kids. Do you have any tips for managing a busy schedule? Dr. Dina: Prioritizing. For me, I am most efficient if I work out in the AM, and then I have energy all day. We prepare kids’ clothes and meals the day before, so morning is fast and efficient. I get work done after the kids are in bed, and on weekends when they nap. Spynga: What is your favourite go-to snack when you need a healthy treat? Spynga: What is your favourite unhealthy treat? Spynga: With fall and back to school coming up soon how can parents prepare their kids for cold and flu season? Dr. Dina: Teach them to wash their hands often, Avoid touching your face, Sleep at least 10 hours a night (most kids should get 12! ), Eat the rainbow, Get outside, and get moving – at least 60 minutes a day, for the whole family!